Evolving Planet at the Field Museum of Natural History in Chicago takes visitors on an awe-inspiring journey through 4 billion years of life on Earth, from single-celled organisms to towering dinosaurs and our extended human family. Unique fossils, animated videos, hands-on interactive displays, and recreated sea- and landscapes help tell the compelling story of evolution—the single process that connects everything that’s ever lived on Earth. The Museum also offers Dozin with the Dinos sleepovers. 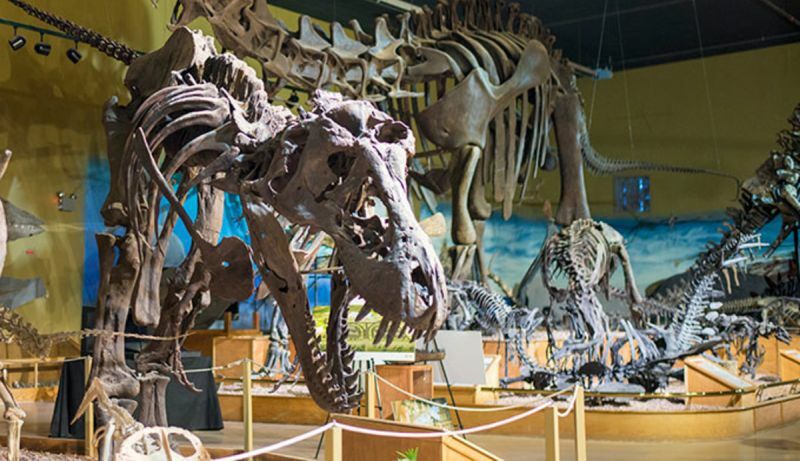 At the Siebel Dinosaur Complex at the Museum of the Rockies in Bozeman, Montana, you can see highlights of the country’s largest collection of North American dinosaur fossils consisting entirely of discoveries made in and around Montana. The Museum is world-renowned as a dinosaur research facility and houses the most T. rex specimens anywhere in the world – currently 13. Notable displays in this Complex include the growth and behavior series of Triceratops and Tyrannosaurus rex, Montana’s T. rex skeleton, the Catherine B. rex specimen, and many, other one-of-a-kind dinosaur finds including dinosaur eggs and babies. Oryctodromeus, a dinosaur that dug burrows and cared for its young inside its dens. You can also watch MOR volunteers remove fossil specimens from the rock and prepare them for study at the Bowman Dinosaur Viewing Laboratory. 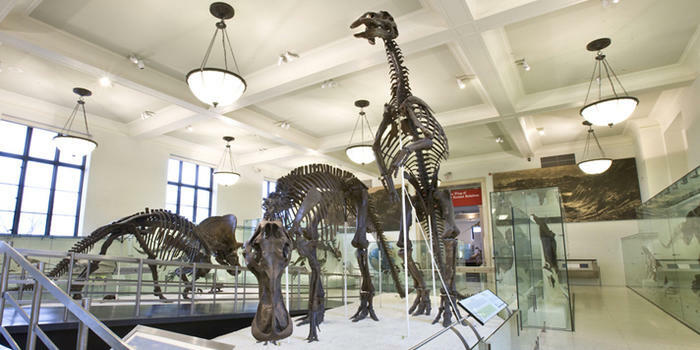 Take a Dino Tour at The American Museum of Natural History in New York which has one of the greatest dinosaur fossil collections in the world. Explore the world-famous dinosaur exhibits on a self-guided tour to see awe-inspiring dinosaurs such as Tyrannosaurus rex, Stegosaurus, Triceratops Apatosaurus, a Dinosaur Mummy – the fossilized imprint of the carcass of a duck-billed dinosaur, as well as the 7-feet long Deinonychus and you definitely won’t miss The Titanosaur, a cast of a 122-foot-long dinosaur. The Museum also has The Glen Rose Trackway, a 107-million-year-old series of fossilized dinosaur footprints, excavated from the bed of the Paluxy River in Texas, which gives a picture of dinosaurs that in some ways is more striking than that offered by fossils. 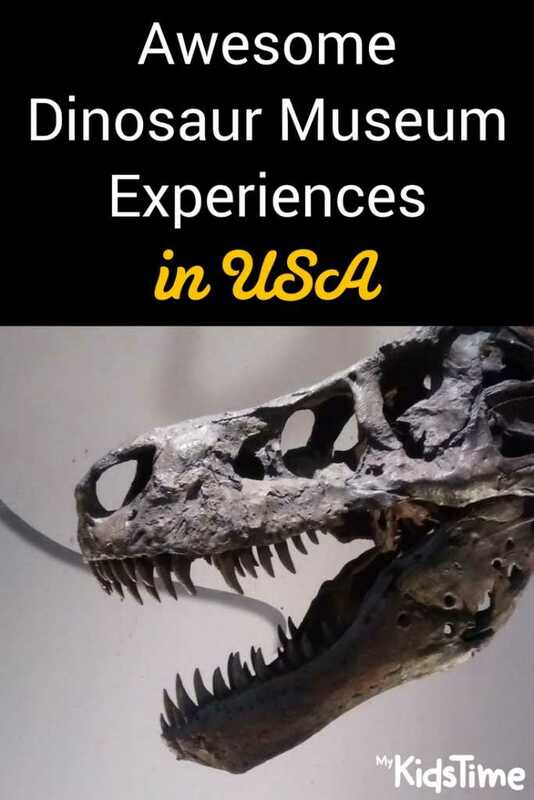 Your resident dino fan might also enjoy downloading the DINOSAURS app available for iOS and Android, which allows you to browse the American Museum of Natural History Collections photographs and illustrations related to dinosaurs, learn about dinosaur species and scientific expeditions to find new fossils around the world, and get behind-the-scenes peek at the Museum. The Wyoming Dinosaur Center is a 12,000 sq. ft. museum with hundreds of exhibits and displays, a preparation lab with visitor viewing and more than 30 mounted dinosaur skeletons. In the Center you’ll find the rare Archaeopteryx, known as the “Thermopolis Specimen”, only 12 known fossils of it exist. You can also see Jimbo the Supersaurus, one of the largest dinosaurs ever mounted in the world at a length of 106 feet. And you can even walk directly underneath a Camarasaurus, standing 30-feet off the ground. In late spring through early fall, you can also take part in their “Dig for A Day Program” where you join a team of paleontologists unearthing fossils. This fun activity caters to healthy fit participants of all ages from young children to active people 65 and over. 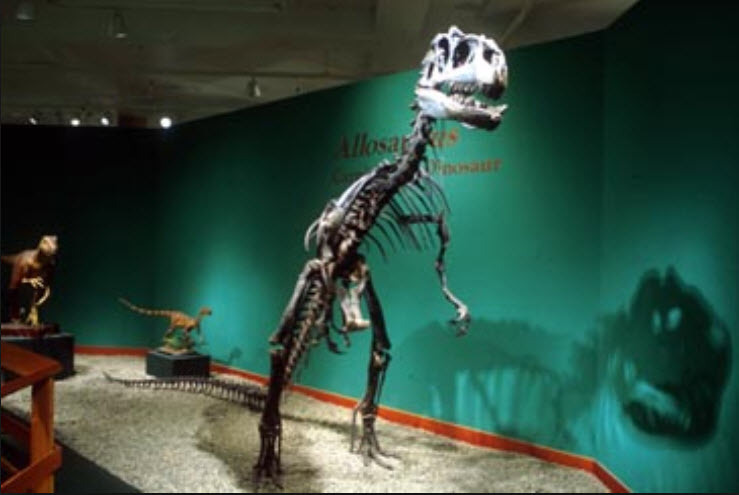 At the Dinosaur Resource Center you can view more than 30 full size skeletons and life restorations, as well as seeing a working paleo lab where ongoing fossil preparation, restoration, molding, casting and mounting can be viewed as part of your tour. The Dinosaur Resource Center is also home to the largest dinosaur gift shop in the region. 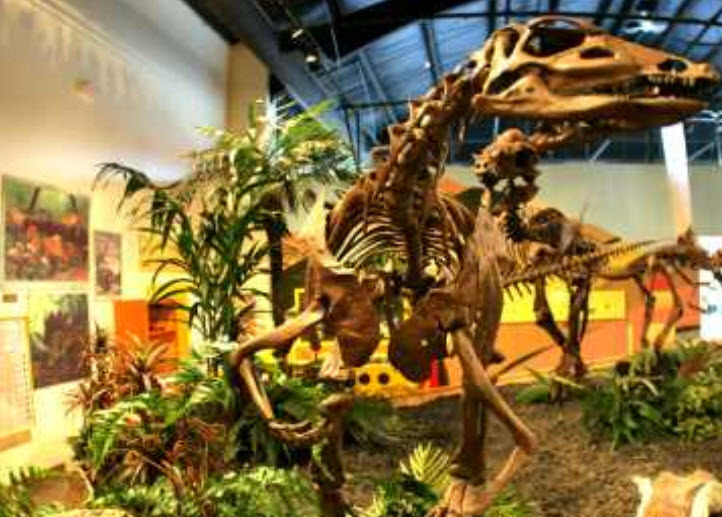 The Dinosaur Journey Museum features a selection of robotic dinosaurs. 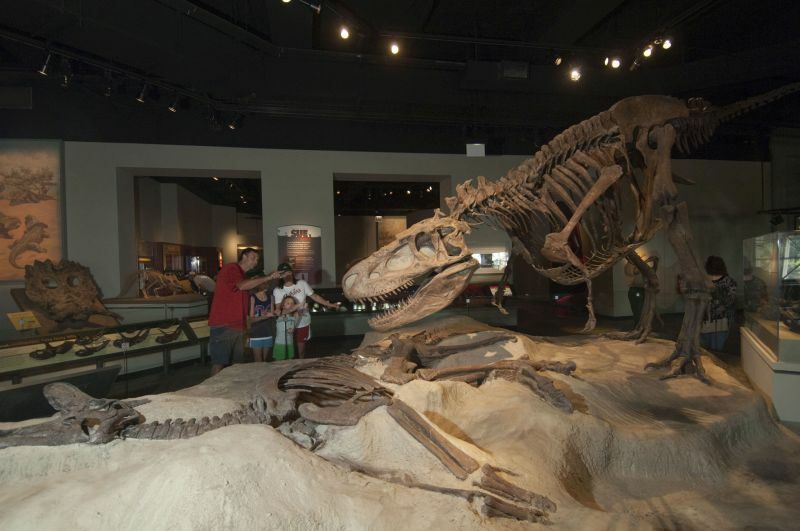 Visitors can also examine real dinosaur fossils, dig into hands-on exhibits, and watch a working paleontology laboratory in action. They also organise hikes in Rabbit Valley Trail Through Time and Dino digs (1/2, full and five-day) so check their website for more information on when those are taking place. At the Natural History Museum of Los Angeles County you’ll find the huge Jane G. Pisano Dinosaur Hall which includes the world’s only Tyrannosaurus rex growth series, featuring a baby, juvenile, and sub-adult T. rex. You can also see an imposing 25 feet long Triceratops, a 150 million year old Stegosaurus fighting with the predator Allosaurus. 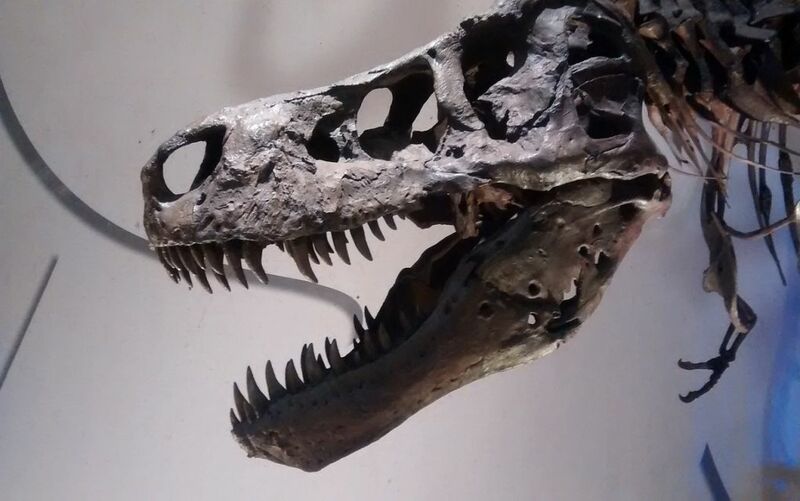 As well as the Dinosaur Hall, kids will enjoy Dinosaur Encounters where you can see dinosaurs roar to life, and the Dino Lab where you can view paleontologists preparing the fossils they have discovered. As you enter the Dinosaur Hall at the Academy of Natural Sciences in Philly you will be amazed by the Tyrannosaurus rex, one of the largest predators to ever walk the Earth, growing up to 42 feet long and an estimated 7.5 tons in weight. More than 30 species are represented in the museum, including Avaceratops, Chasmosaurus, Corythosaurus, Deinonychus, Pachycephalosaurus, Tenontosaurus, and Tylosaurus. 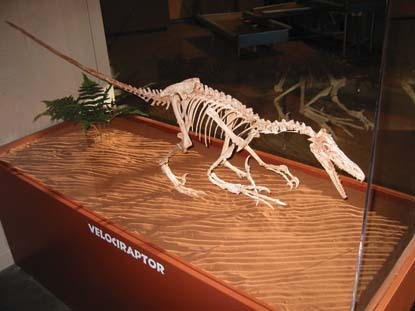 In addition to the skeletons, visitors can view dinosaur eggs, footprints, sculptures, murals, paleontologist tools, a life-size model showing the internal anatomy of a Stegosaurus, and a green-screen video studio where you can project your own images into a world full of dinosaurs. 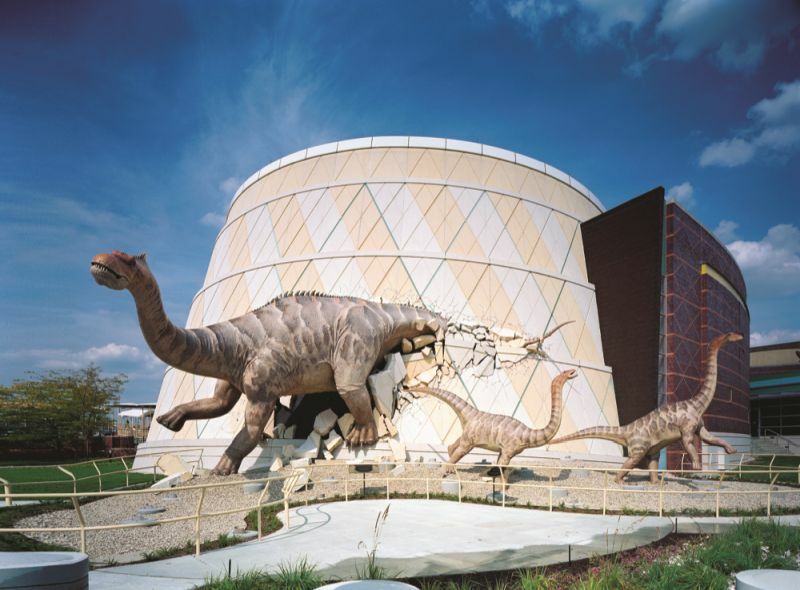 Widely considered one of the top children’s museums in the world, The Children’s Museum of Indianapolis has a great collection of dinosaurs. As you approach you’ll see dinosaurs exploding out of the side of the building! In the Museum there are several exhibits filled with dino fun. 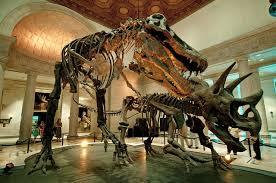 Kids can touch a real T. rex bone, see dinosaur skeletons up close and look for dinosaur bones. The Museum’s Dinosphere: Now You’re in Their World® is a unique exhibit designed to immerse visitors into the Cretaceous period, 65 million years ago, when dinosaurs last roamed the earth. It features real T. rex, Gorgosaurus, and Triceratops fossils and other rare specimens set in realistic environments with dynamic lighting and sound effects. Kids will also enjoy the opportunity to watch paleontologists work on real fossils bones discovered at family and educator dinosaur digs at the Paleo Prep Lab and you can ask questions to the working scientists. 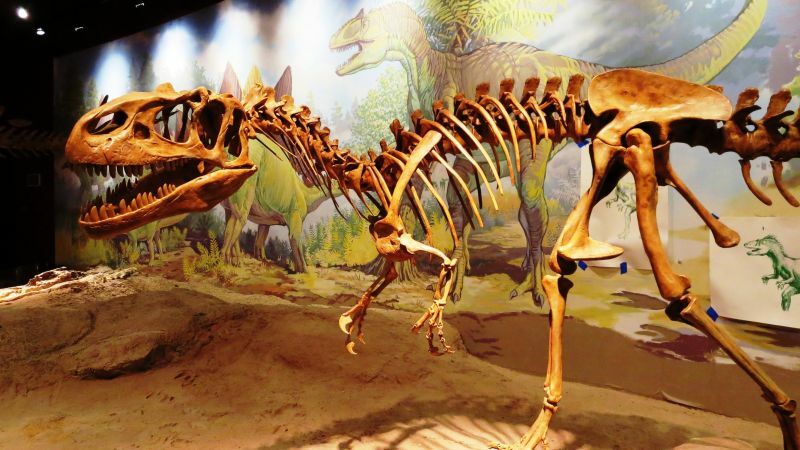 The Natural History Museum of Utah features a fantastic display of paleontology that includes the latest dinosaur find, which is frequently updated, in the Past Worlds exhibit. At the Museum you can meet Lythronax argestes, a remarkable new species of tyrannosaur and ancestor of T. rex, unearthed in Grand Staircase-Escalante National Monument (GSENM) in southern Utah. In the exhibit you’ll also find an excellent Ceratopsian Wall with Triceratops and other related dinosaurs with horns and frills. lesser-known dinosaurs like Thescelosaurus and Sphaerotholus. One of the oldest dinosaur museums in the world, the National Museum of Natural History has to restore and refurbish exhibits periodically. Its National Fossil Hall is currently closed for renovation, it will reopen to the public in 2019 when visitors will be able to explore how life, environments, and ecosystems have interacted to form and change our planet over billions of years. 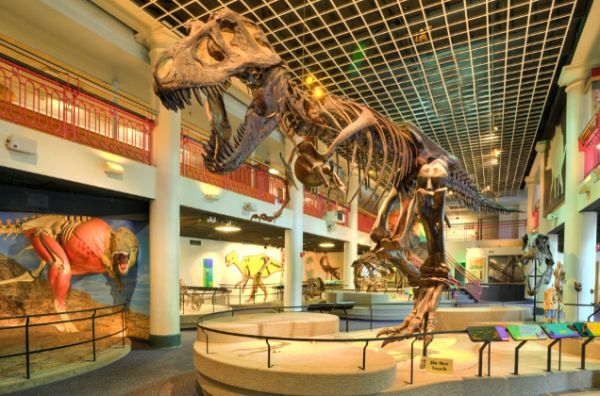 At the permanent galleries of the Burke Museum in Seattle you can see an Allosaurus, Stegosaurus and Triceratops as well as the oldest Washington dinosaur fossil, a partial left thigh bone of a theropod dinosaur, the group of two-legged, meat-eating dinosaurs that includes velociraptor and Tyrannosaurus rex. Also at the Burke until June 2018 there’s a special T. rex exhibit featuring the huge 3,000-lb skull of Tyrannosaurus rex, only the 15th ever discovered. In the work-in-progress exhibit, visitors can look through windows to see paleontologists at work on the 66-million-year-old T. rex skull, as well as other dinosaurs and prehistoric animals from other research trips. 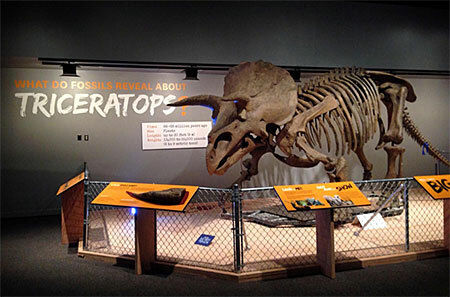 The “Dinosaurs in their Time” exhibition at Carnegie Museum of Natural History in Pittsburgh features real dinosaur fossils from throughout the Mesozoic Era, the Age of Dinosaurs, displayed in reconstructions of their ancient habitats. Dinosaurs in Their Time uses up-to-date paleontological evidence to more accurately reconstruct the appearance and behavior of these colossal creatures. About 75% of the more than 230 objects on display are original fossils from one of the finest paleontological collections in the world, and most of the exhibition’s dinosaur skeletons are real, not replicas. Several of these skeletons, including those of the iconic dinosaurs Tyrannosaurus rex, Apatosaurus louisae, Diplodocus carnegii, are holotypes, that is, the original specimens upon which their respective species are based. The University of California Museum of Paleontology in Berkeley has the largest paleontological collection of any university museum in the world however collections are only open to the public during Cal Day, their annual open house day. an adult Triceratops skull along with a cast of the smallest Triceratops skull ever found. Over to you now. Have you visited a great dinosaur museum in USA? Any that you enjoyed that we should include? Tell us in the comments below.